13.8 billion years ago, give or take 37 million years, something remarkable happened. An intensely dense ball of quarks, leptons, and gauge bosons underwent a massively rapid period of expansion forming quark-gluon plasma (with other bits floating around). I’m sure everyone is familiar with quark-gluon plasma by now so I won’t bore you with the 1st grade science lesson (yeah, right!). This plasma then quickly cooled allowing the quarks to bind together with the help of their little friends, the gluons. This new combination is what we know as protons and neutrons, named differently based on their charges. These combined further via the strong nuclear force to create atomic nuclei, and the lepton particles named “electrons” hung around for some fun. Other particles that were left over did some crazy stuff too including a guy named the Higgs Boson who basically made all the particles that interacted with it feel heavy. Like, really heavy. He gave them mass, and he gave it completely for free because he was a nice guy. Come to think of it, I may have met him the other day at Cool Burger Town. He must have taken my order because that guy gave me free refills on my Coke! Yeah, it must have been that Higgs guy. These new particles were called atoms, and they liked to congregate. With the help of intense heat and pressure they started smashing into each other (in the center of stars) and they formed into many different types and even started to hang out with other atoms that looked the same. Now I want to say as an aside that meeting people of different backgrounds is great and you should never just associate with people exactly like you. Mix things up, it will change your life. Regardless, these particles were a little segregated which led to the creation of the elements, which I guess isn’t so bad. The A. Lange & Söhne Double Split is a work of art in any respect. But what it also is defeats the beauty in an instant: it is the first double-rattrapante mechanical chronograph in the world. That means not only does it stop time, but it can stop time twice, on two dials! The Double Split has the ability to track two times simultaneously up to 30 minutes, an obvious first for any mechanical chronograph, with the added ability to reset each timer individually while the timers are running. How about you let that soak in as you let this picture of magnificence wash over your soul. Ok, if you don’t need smelling salts after that you must be dead or perhaps a barnyard chicken. Cluck. But looking at that L001.1 movement is simply a joy for me. The depth created by the multiple layers of perfectly finished parts is truly amazing, I feel like I could climb on down into the movement and walk around, it is so deep. For a guy like myself, who is ALL about the mechanics, there can be no finer example of the perfected functional object than the Double Split. Why is it the perfected functional object you ask? (I know you didn’t ask, but I want to tell you anyway) The reason the Double Split is “perfected” is because it uses features that are at the top of watchmaking abilities and executes them in a perfect way. First off, there is a column wheel to engage the chronograph function. There is nothing wrong with a lever actuated chronograph, but the delicateness and smoothness of a column wheel can only be felt to be understood. 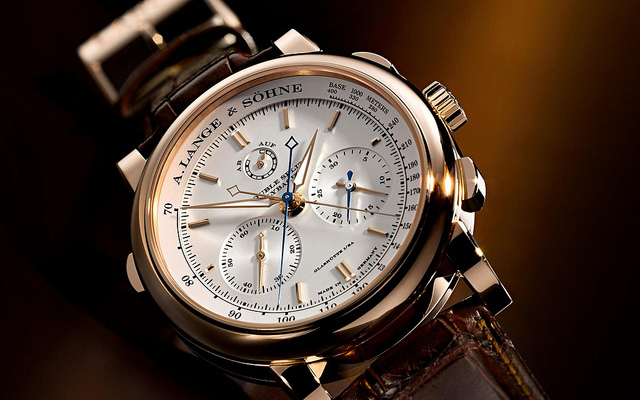 A. Lange & Söhne employs these with the utmost attention to detail. Perfectly polished and straight grained, beautiful. A patented disconnector mechanism allows for the rattrapante hands to be stopped AND separated while the chronograph hands are still running, reducing friction and keeping the timekeeping gear train from losing power. Here is an illustration taken from their website showing the split seconds mechanism. These are followed by a second column wheel (oh yes, there are two!) which controls the rattrapante function of both seconds and minute hands. 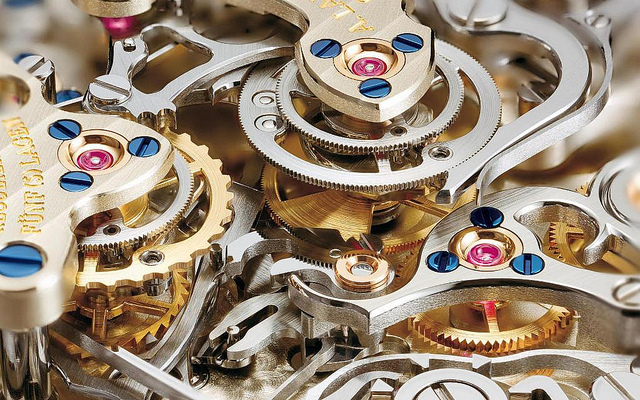 Anybody who knows about column wheel chronographs will tell you the hardest part of a column wheel is the precise adjustment needed with the levers and cams to make it all work smoothly together. Add in a second column wheel and you quadruple the complexity of adjustment. Now add in the rattrapante mechanism, combined with an added split minute hand to deal with and I think the complexity now reaches the limits most brains can comprehend! I know my head is hurting trying to follow the movement of all the levers and wheels and cams that make up the 465 parts (half of which are moving mind you) in this L001.1 movement. People have been talking about A. Lange & Söhne’s chronograph movements for years, and they are without a doubt some of the most beautiful chrono’s out there. With the introduction of the Double Split, it is as if they took a winning formula, multiplied it by 1000, added in a dash of ‘Oh my god’ and called it a day. What a day it is! I have read reviews of this piece all over the internet, spoke to people from all over and pretty much everyone gushes about the incredible detail and more importantly the insane amount of depth created by this movement! Frank Geelan from Monochrome described it as the “most brilliant three-dimensional mechanical version of the grand canyon” and its legend should be “One Chronograph to Rule Them All.” Peter Chong calls it “the secret watch of watchmakers” and says he can’t get enough of this movement. Jason Heaton from Gear Patrol said that to “distill down its essence to a mere hands-on review seems almost blasphemous” so instead it should just be “gazed on and lingered over.” I can’t say that I disagree with a word they say. But what about people who like the movement but care more about what it looks like when it’s actually on the wrist? Well guess what, it’s perfect on the other side as well! Just take a look at this. See what I mean? Perfectly balanced, perfectly proportioned, easy to read, clean and classic and every bit as elegant as a Calatrava in my opinion. But then I like mechanics. To people who only love a thin watch, or only love a timepiece that nobody will “notice” because it is so elegant it disappears into your wrist, maybe they will find this piece not defining elegant in their book. I think the shape of the case, the simple layout of the dial and tachymeter ring, the beautiful downturned lugs, the gorgeous shaped hands, and the perfectly polished rose gold all make this watch toy with the idea of elegance and incredible functionality. If you weren’t a WIS, and simply saw this watch on a man in a tux, you would not think it is out of place, or is too “sporty” or “masculine.” Instead you would say, wow, that is a beautiful timepiece! 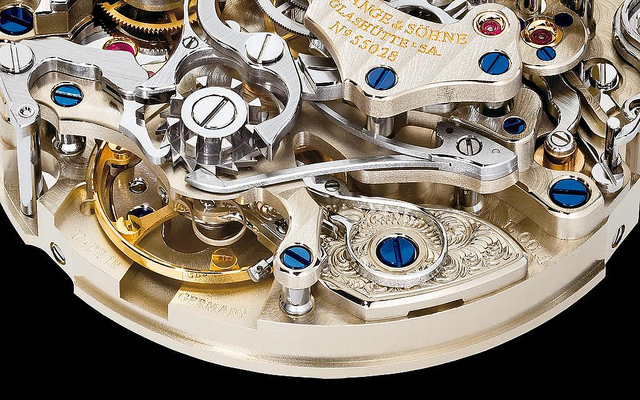 I could talk all day about this beautiful watch and moreover the incredible and endless valleys of the movement, but why do that when you can just stare at the movement. That’s what I want to do. Will you join me in gazing into the canyons of mechanical treasures that are the Double Split? Oh where was I? Right! On to the breakdown! 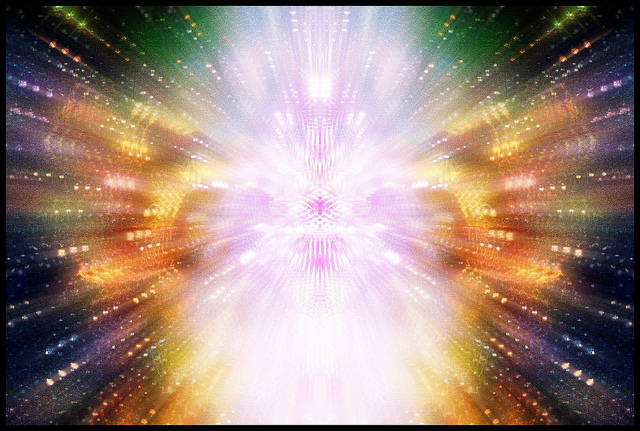 Wowza Factor – 10 Really, did you expect for a second that it would be any less? A perfectly beautiful watch with the deepest and most awe inspiring chronograph movement I’ve ever seen! Late Night Lust Appeal – 214 gn » 2,098.623 m/s2 Only a couple other timepieces have made for this much body smashing lust forces, and it stands in good company! M.G.R. – 74.15 Only the second movement to break the ceiling on the scale and it does so just slightly ahead of that incredible Wankel inspired ZR012. So I say again - a DOUBLE SPLIT RATTRAPANTE! Boom. Added-Functionitis – Deadly I’m afraid that this case is terminal and no application of ‘Gotta-HAVE-That’ cream will save your life. The only possible solution is to undergo extensive surgery to graft the watch to your skin and become a symbiotic organism! Clams Per Pound – $1.2 million Probably my number 1 (if not a tie for number 1) grail watch. There is nothing more to say. Ouch Outline – 13 – Stepping on a Lego, forever. Any pain endured would be worth it to own this piece. Living an entire life without shoes and walking across fields of Lego’s would not deter me from acquiring this timepiece. Mermaid Moment – Double Split, click, click, click. Being able to hit those pushers and watch the ballet of parts in the L001.1 movement means I fell in love with a click, click, click. As always, I do not own any of these photos and they all can be found freely on the interwebs. For more awesomely incredible photos of the Double Split, check out the Gear Patrol A. Lange & Söhne Double Split Photo Essay or head on over HERE for some incredible macro shots! 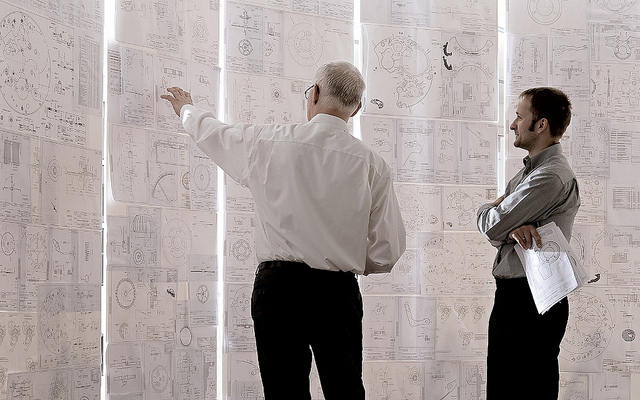 If you have time, head on over to A. Lange & Söhne to see more and read their info about the piece and wander about their site to see much more about their products and some cool videos about the manufacture and engineering! Come back next week for more, have a great day and DFTBA! Last edited by Ernie Romers; October 28th, 2013 at 21:51. Simply remarkable. Few engineer a fine movement quite like Lange. If this forum labels the new Nomos as 'transcendent', I'm not sure how you would classify this clearly superior masterpiece. Best of the Best; I can't think of a better Chrono than this. Well if they really wanted to do something special and show they are the leaders in watch design-- they would have made their components from anti-matter--- as at the time of the big bang-- both were created almost equally. Gorgeous watch and incredible craftsmanship. Unrivaled craftsmanship and superb engineering, thankfully for my financial well being it's not the kind of piece that moves me. Now the more basic Lange's on the other hand . . . Under the double split mechanism.